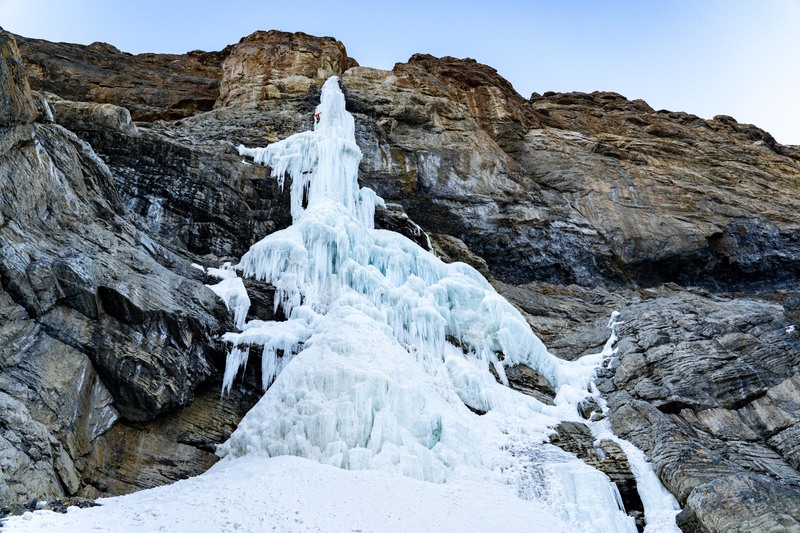 The first Piti-Dharr International Ice Climbing Festival took place in India's Spiti Valley on January 5-15. 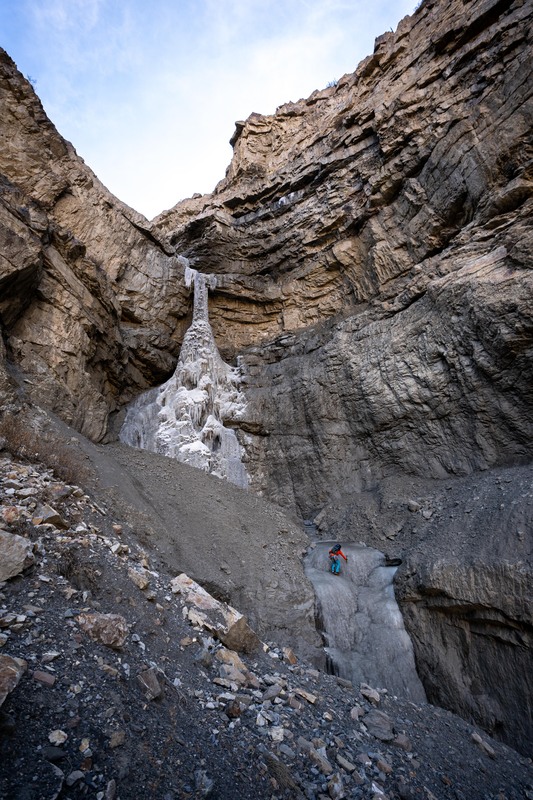 During the event, Indian climber Bharat Bhushan and Americans Ari Novak and Karsten Delap completed the first ascent of Frozen Diesel (HWI 6+), and Novak and Delap established Snow Leopard (HWI 7, 150m). "HWI" stands for "Himalayan water ice" and accounts for elements such as high altitude, in addition to technical difficulty. We achieved something great this year, and we did it as a community of friends, from local Spitian novices to professional ice climbers from the USA. 2) Created two risk-managed training crags at Lingti and Gypsy Glacier site. 3) Watched with joy as local climbers...went from being novices to confidently moving on ice and loving it! 4) We cemented the HWI (Himalayan Water Ice) grading, India's first indigenous climbing grading system. 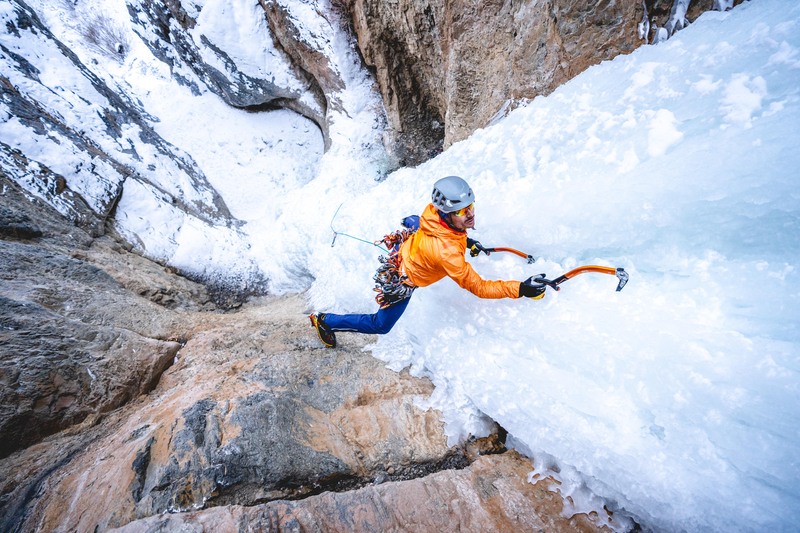 This grading is not only the history of ice climbing in India, but will allow local climbers to put up routes for years without comparing [them] with other climbs around the world. This grading system is the legacy of our little community. The successful completion of our ice fest fills me with pride and with enthusiasm for the future. Pride because of what we achieved. As part of the fest, at least 10 significant, world-class routes were opened, with all but one of them having Indian climbers of the first ascent teams. These routes have already begun to gather international attention, showing not just the ice climbing world, but also the Indian climbing community the possibilities of Spiti (and of ice climbing in the Indian Himalaya). But that is only one facet of what happened in Spiti—simultaneously, we also put together a festival that brought together international professionals with Indian climbers and Spitian novices, many of whom had never climbed before.... In a few days, with Karsten's advice and Bharat's leadership, we had turned this around and managed to create a safe, productive teaching and learning space, where we saw local climbers thrive. Enthusiasm, in fact a hopeful excitement for the future, is what I feel when I realize what the union of these two achievements means for us. 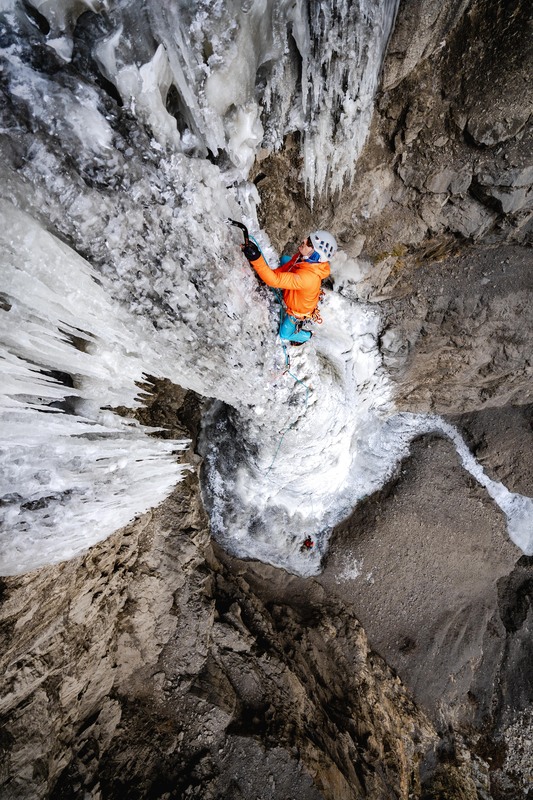 Ice climbing in Spiti (and in fact, the Indian Himal) is all about first ascents. The 350 odd meters of Frozen Diesel or the 150 meters of Cowboys in the Mist is only the last (and most technical) few steps in the journey that was needed to climb these routes. It took years of exploration to identify these routes—in fact, Bharat, Prerna [Dangi] and I saw Stairway to Something (HWI 4, 380m) on our first trip to Spiti. Ari and Karsten, in a sense, shone a very bright torch on the way forward for us. They showed us what was necessary to be able to take those last few steps. Snow Leopard is more than a climb for us; it's a beacon, shining the way forward. We now know what skills we need (and if you'd seen how fearless our first-timers were, you'd believe we can develop those skills pretty quick). By Day 4 of the fest, Bharat was teaching on the lower pitch of Frozen Diesel! Climbers like Bharat, Prerna and I have spent many, many years exploring. This is only the beginning for us. We can be opening new climbs for the next 20 years (at least). We intend to take the lessons we learned, to keep sharing them, and to keep growing and to forge our own identity. Snow Leopard, located in the Spiti Valley outside the village of Morang, got its name from the cat tracks that Novak and Delap encountered at the base of the massive frozen waterfall, which is over 14,000 feet (4267m) in elevation at its top. "This route was like nothing else we've climbed here in India," said Novak, who completed nine water-ice first ascents with Delap between December 27 and January 17. "It was like a glacier was put on its side, dead vertical and hit with a missile. There were massive overhanging features, multiple free standing pillars and we had to corkscrew around the back of the ice to avoid car-size hang fire. 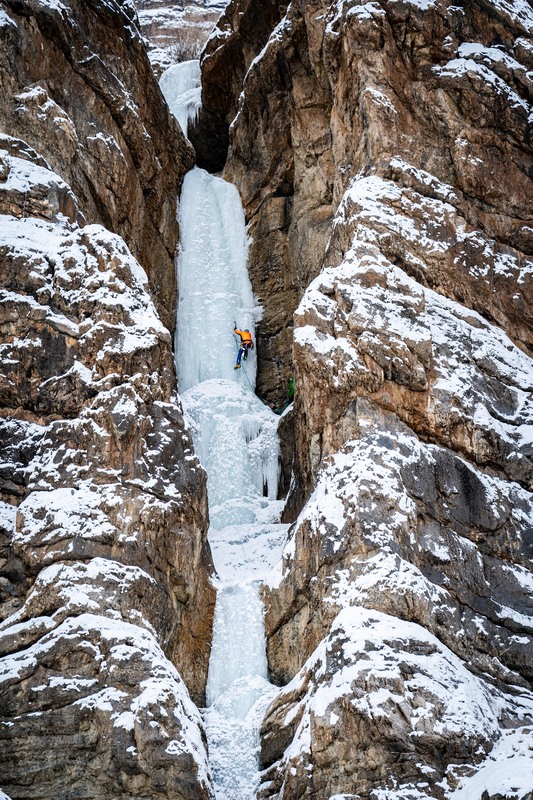 The topout was difficult, too, with no protection for the last 45 feet and the thinnest straw of ice that had water rushing through [it].... We barely had enough ice to get off the route but it was without a doubt one of the most amazing experiences of my life." Frozen Diesel is named for its streaks of black ice, which are a result of mineral-rich stream flows that give the ice a unique look. The climb is outside the village of Pho and features 370 meters of continuous ice that is broken up into four pitches. The final pitch is a 40-meter freestanding pillar. Bhushan said the day they climbed Frozen Diesel started out with frustration when their car didn't start. The delay led the team to pick a new destination to explore and that is how they ended up finding the frozen, black-streaked waterfalls of Frozen Diesel. "Frozen diesel was completely hidden," he said. "I saw it for the first time that day. It was pure gold for me.... It was my first time climbing cauliflower ice on a longer route. The top was really sketchy in the final pitch because of the quality of the ice. It was very fragile.... It was a great experience to climb with Ari and Karsten. They were amazing people and always provided me with great tips and small things...to improve on. I am very fortunate to climb with them and see their climbing style." Bhushan and his partners continued the fervent pace of climbing after the Americans left. "We're still finding new frozen waterfalls," he said. 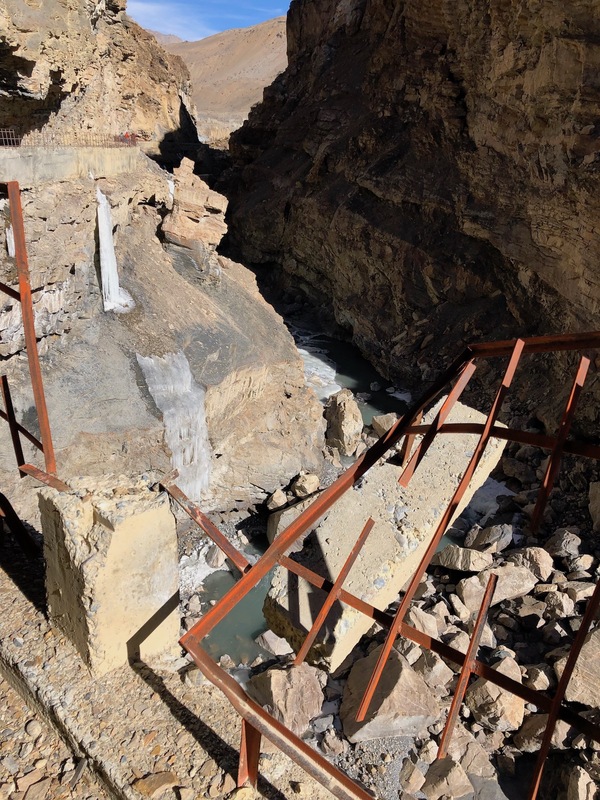 "We have put up five new lines in the last four days close to the Kaza area. We will continue for our journey until February 20 here in Kaza and climb as much as we can." It was last February at the Michigan Ice Festival. I was sitting at a dive bar with Angela VanWiemeersch when an Indian man dressed in a leather biker jacket walked into the bar with a set of Trango Raptors over his shoulder. [Angela] looked at me and I looked at her with a big smile. I climb on Raptors [too].... I said, "Hey, you, come here, we're going to be friends." He turned to me and said "OK." The man was Karn Kowshik and we did quickly become friends. He explained that he was in Michigan to give a talk about ice climbing in India. "There's ice climbing in India?" I said. He pulled out his phone and showed me route after route of beautiful massive frozen waterfalls and then he said none of them had been climbed. "You should come to India," he said. I was instantly hooked. Within hours of meeting Karn, I had approached Karsten Delap and he agreed we should go to India to explore this valley of unclimbed ice that Karn had shown me. We chose to visit the Spiti Valley and the village of Kaza during what would be the first ice fest in the region. Our goal was to contribute gear and our teaching experience and also to team up with local Indians to explore new ice lines.